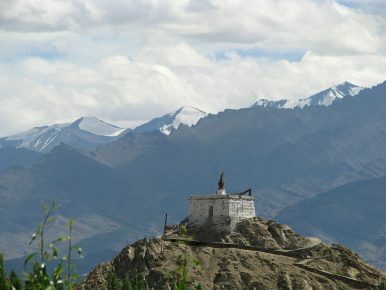 A glimpse of the mountainous terrain near Leh, Ladakh. The desolate landscapes of Ladakh in Jammu and Kashmir and neighboring Gilgit-Baltistan (part of undivided Kashmir but presently administered by Pakistan) are in the news once again as both India and Pakistan propose to extend rail linkages to these regions. The idea of railway connectivity is indispensable to High Asia’s geostrategic calculus, but feasibility remains a question. Will the future see trains penetrating the Karakoram Mountains, which also house a concentration of the world’s highest peaks? The idea of railroads cutting across the high mountains of the Karakoram and Trans-Himalayan belt is not new. Back in the days of the “Great Game,” strategists from British India also planned railroads to link the mainland territory with these highlands. Transportation became an indispensable part of the British frontier policy, which was driven by a quest to secure the mountain passes lying along the South-Central Asian axis. The passes were perceived to be vulnerable to the Russian Army, which was foraying in the Pamir Mountains (the present-day Wakhan Corridor and Tajikistan) by the late 19th century. On the other hand, given the importance of the Karakoram branch of the Silk Road network, there were voices calling for establishing cross-regional rail connectivity for economic reasons as well. Speaking of Gilgit, veteran mountaineer and cartographer Sir William Martin Conway proposed that this small town “must grow to be an important trade center, and possibly, to take a wild leap of imagination, a railway junction on the line of India to Kashgar, where the Samarkand branch will turn off!” This “leap of imagination” revived not in the way Conway thought, but as a tool of the regional balance of power, with the China-Pakistan partnership on one side and India on the other. Once a theater of a territorial scramble between Russia and Britain, the two regions of High Asia (Ladakh and Gilgit-Baltistan) still exhibit the same old tensions, albeit with new players in the game: namely India, China, and Pakistan. Trading caravans have long disappeared but the imagination of High Asia as a strategic — and disputed — frontier zone remains strong even in the post-colonial era. Kashmir remains a hotspot; Pakistan succeeded in taking control of Gilgit-Baltistan following the first Indo-Pak war in 1947-48; China took control over the Aksai Chin region following the Sino-Indian war in 1962. Since the transformation of these mountains into war zones, all three nations have been proactive in strengthening their respective defenses, with the proposal of railways being the latest addition to their infrastructural arsenal. India’s growing strategic footprint in Ladakh, along with a heavily militarized Gilgit-Xinjiang corridor, has instilled a feeling that these borders are vulnerable without railway connectivity. Named after the Khunjerab Pass at the Sino-Pak border (also the world’s highest border crossing accessible by car, at an altitude of 15,400 feet), the proposed 411 mile railway line plans to link Pakistan’s Havelian (near Islamabad) with the Khunjerab pass (and further up to Kashgar in China’s Xinjiang region). A pre-feasibility study (involving a consortium of consultants from Austria, Germany, and Pakistan) carried out in 2007 estimated that constructing a railway line parallel to the Karakoram Highway from Havelian to the Khunjerab Pass would cost around $10 billion. With the initiation of the China-Pakistan Economic Corridor (CPEC) in 2015, talk of Khunjerab Railway revived but the project did not find an exclusive mention in CPEC. Though Islamabad has repeatedly clarified that the railway project remains a part of CPEC’s long term agenda, the main challenge is the construction of a railway network in this fragile region characterized by frequent earthquakes, floods, and landslides. In 2010, a massive landslide in Hunza (northern Gilgit) submerged a 12 mile stretch of the Karakoram Highway under the newly-formed Attabad Lake, created after the landslide blocked a river on the site. It took five years to re-align the highway with tunnels and bridges, which was finally opened last September. In the meantime, the submerged stretch of the highway could only be crossed by ferries, thereby bringing swift traffic movement to a standstill. Hence, the apprehension still remains whether laying a railway line would be feasible in the first place. In a PowerPoint presentation by Pakistan Railways, uploaded on the website of the Asian Development Bank-led Central Asia Regional and Economic Cooperation program (CAREC, of which China and Pakistan are members), it was stated that Pakistan was all set to construct the Khunjerab Railway link. Though it is too early to comment on whether Khunjerab Railway would become a reality or not, the impressive engineering feat achieved by China in constructing the Qinghai-Tibet railway line does not rule out the project being attempted with Chinese assistance, given that the rail link would match China’s strategic calculations. China has expanded its railway network southwards from Kashgar to Hotan, hence expectations abound that a rail link leading south to the Khunjerab Pass and further into Gilgit-Baltistan may become a reality. As far as the strategic cooperation between China and Pakistan goes, the Karakoram Highway has been used time and again for transporting nuclear missiles and suspected fissile material to Pakistan. No doubt in the long term horizon, an all-weather rail link, if constructed successfully, could further cement the strategic ties between the two nations. Beginning from India’s independence, Ladakh, owing to its location between China (Xinjiang lies to its north and Tibet to its east) and Pakistan, has faced external hostilities more than any other border region of India. Less than 15 years after losing a large part of its western region (Baltistan) to Pakistan in the war of 1947-48, Ladakh’s northeastern region, Aksai Chin, was lost to China. In the events leading to the Sino-Indian war in 1962, New Delhi was caught by surprise when, in 1957, it discovered that China had been constructing a road (National Highway G219) in Aksai Chin linking Tibet with Xinjiang. Later, during the Kargil War, the main strategy of the Pakistan Army was to cut off the National Highway 1A passing through Kargil, the sole link connecting Srinagar to its west and Leh to its east. The highway came under direct fire when the Pakistani army occupied the peaks overlooking Kargil town. Moreover, the Pakistan Army’s occupation of peaks in Kargil’s neighboring Batalik sub-sector threatened to cut off linkage with the Nubra and Shyok Valleys, further threatening the routes leading to Siachen glacier, the world’s highest battlefield as well as India’s northernmost point. Apart from air operations, the indispensable role of the Indian Army’s soldiers and the use of Bofors guns to pound enemy posts highlight the importance of the swift mobilization of men and materiel at a short notice. Therefore, added to the harshness of terrain, an absence of alternate supply routes was the key challenge faced by the Indian Army during its wars with Pakistan and China. Although no major confrontation has taken place since 1999, today, Ladakh is faced with new challenges of frequent incursions by Chinese troops and the ever-blossoming Sino-Pak strategic ties, which have manifested in growing militarization of Gilgit-Baltistan. Considering these developments, the first proposal to set up strategic railway routes along India’s northern borders was sent by the Indian Army Headquarters to the Ministry of Defense in 2010 and an in-principal approval was granted. In its 2011-12 Rail Budget, the Government of India proposed to expedite work on the ambitious Bilaspur-Mandi-Manali-Leh railway line connecting the Himalayan state of Himachal Pradesh with Leh (the historical capital of Ladakh). In a pre-feasibility study, construction of an all-weather broad gauge rail link from Bilaspur to Leh was estimated to cost INR 22,831 crore (approximately $3.4 billion, according to the present exchange rate) along with a negative rate of return of 4.46 percent. Despite the proposed line being declared a national project, the Ministry of Railways was initially reluctant to finance, it citing commercial and topographic unviability. However, with no signs of thaw with China regarding the border dispute and growing Sino-Pak bonhomie, strategic concerns have outweighed New Delhi’s financial considerations and work on the railway line has revived, though still in its nascent stage. To begin with, the responsibility of a route survey has been allocated to Rail India Technical and Economic Service (RITES), a rail infrastructure consultancy firm. An initial amount has been disbursed for this purpose and land is being sought by the Indian Railway in Leh to set up a camp office for the project. Also, one branch of the Bilaspur-Leh railway is expected to connect Demchok and Chumar, located south of Aksai Chin. Interestingly, when Chinese President Xi Jinping was on his visit to India in September 2014, Chinese troops entered Chumar at the same time, prompting Prime Minister Narendra Modi to personally apprise the Chinese leader of New Delhi’s concerns. Separately, New Delhi also plans a project linking Srinagar to Leh, with the line passing through the strategically located Zoji La (a vital pass linking Kashmir valley to Ladakh) and Kargil, as the Indo-Pak border in this region is still defined by the temporary border (Line of Control), pending a final decision on the Kashmir dispute. Across the border, in the name of providing security to CPEC projects from external threats, the Pakistan Army has set up a Special Security Division in Gilgit this year, comprising of 15,000 troops despite the fact that hardly any major CPEC project has been allotted to Gilgit-Baltistan. On the other side, with China’s border transgressions in Ladakh registering a rise, the Indian Army has undertaken massive force deployments and infrastructure upgrades in Ladakh. These include re-alignment of roads, construction and revamping of Advanced Landing Grounds (ALGs) to support heavy cargo planes and fighter jets, and the recent deployment of a full-fledged tank brigade this year. As these flashpoints continue to simmer with no likely solution to these border disputes, the idea of trains chugging along and across the Karakoram and Trans-Himalayan is more than welcome for both India and Pakistan. What still needs to be assessed through technical feasibility studies is whether such a complex topography and highly sensitive terrain can actually sustain railways or not. Prateek Joshi is a postgraduate in International Relations from South Asian University, a SAARC nations project and a researcher on South Asia’s strategic affairs. India-China Border: Another PLA Incursion? Plus, the OPM breach, Japan's navy in Southeast Asia, and North Korea's compact nuclear weapon. Security reads you may have missed.